What did we do before Google? Who did we ask when we had a stupid, embarrassing or a personal question? A friend or coworker? Our parents? The local librarian? Was there a toll-free number to call… 1-800-Ask-A-Question? We had encyclopedias, but they weren't as helpful as Google. The only downside to modern technology is something called "Google Trends" that tracks what people are searching for. 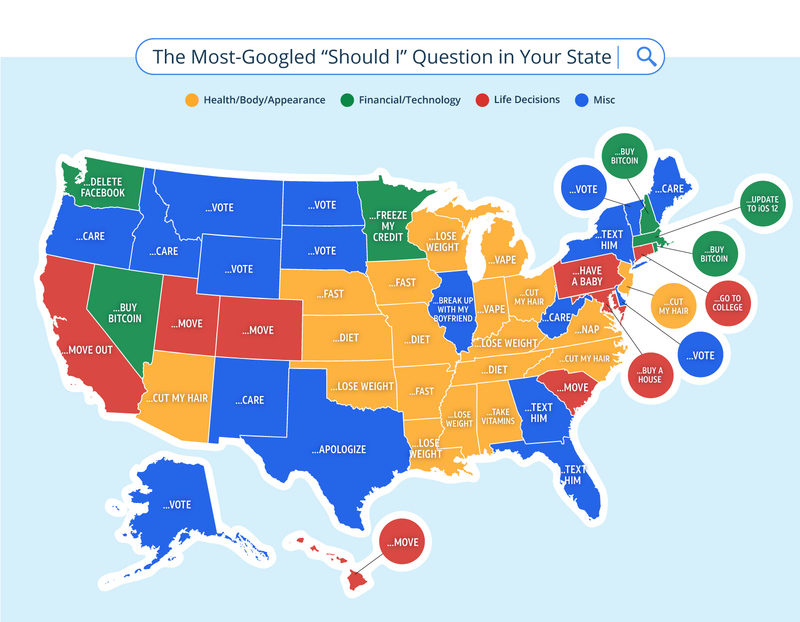 AT&T put together a list of the most commonly googled questions in each state. Let's talk about New England. New Hampshire: Should I buy Bitcoin? Massachusetts: Should I update to iOS 12? Connecticut: Should I go to college? Rhode Island: Should I buy Bitcoin? Interestingly enough, "Should I care?" is the most googled question in five different states: New Mexico, Oregon, Idaho and West Virginia. Obviously, these people cared enough to make the inquiry. The funniest query is "Should I delete Facebook?" in Washington state. To see what the rest of America googled, click here.